The Old Oakland Cajun restaurant is known for its irascible owner — and its delicious food. Plus a Bakesale Betty manager breaks into the scone business. OB's Cafe: not for the sensitive. 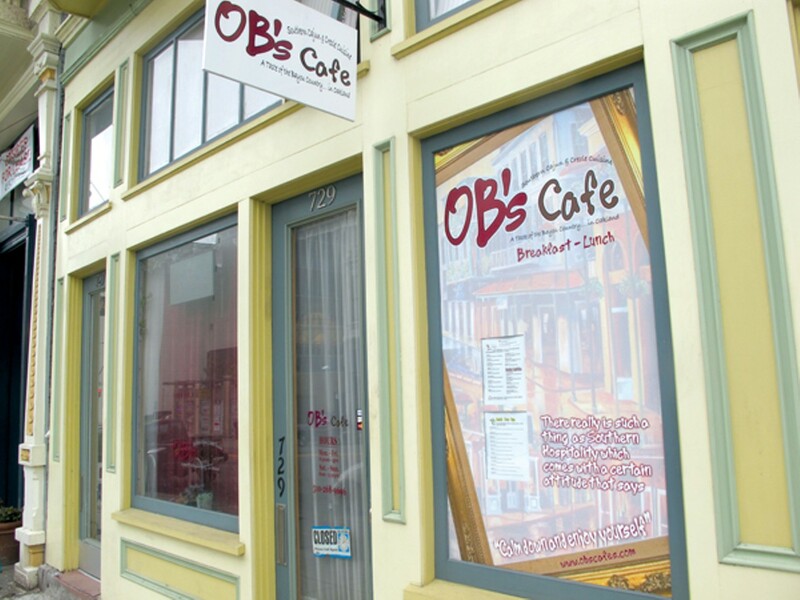 OB's Cafe may be a fantastic restaurant, but the owner isn't interested in your praise. A food writer friend hipped me to this tiny Cajun spot in Old Oakland, saying that he "didn't want to take credit or blame" for the suggestion. Intrigued, I did my Internet due diligence. The OB's website is a slick Mardi Gras party, with Flash animation, zydeco music, and a curious slogan: "There really is such a thing as Southern hospitality which comes with a certain attitude that says, 'Calm down and enjoy yourself.'" Online reviews tell a more nuanced story. On one hand, you have scores of one-star reviewers, telling tales of OB's irascible owner berating them or kicking them out for minor infractions like asking for a menu or a glass of water. Comments like "He threatened to kill a customer!" and "The Soup Nazi is a saint compared to this guy!" paint a bleak picture. On the other hand, you have five-star reviewers gushing about the best shrimp and grits since they left Louisiana, calling the formidably named chef/owner (Javonito De La Cruz De Morfulleda, aka OB) a Van Gogh in the kitchen, and describing his catfish as "life-altering." Between the five-star reviews and the one-star reviews is very little middle ground. You couldn't keep me away. I stopped by with my friend Christo on a recent Tuesday afternoon, feeling a potent mixture of hunger and fear. Inside the wee space, a TV blared some daytime drivel, a woman kvetched on a hot-pink phone while sipping coffee through a straw, a grad-student type read a book and drank grape Shasta, and a large man sat glued to the TV. When we approached the counter, the big man barked, "What do you want!" without looking up. "Ah, lunch?" OB gruffly ordered us to sit down. He seemed put out. Besides a small lending library of cheap horror books and textile manuals, there weren't many niceties at OB's. We didn't get water. We had to find menus in a stack near the entrance. It was loud, yet weirdly desolate. When OB approached for our order, he stood there without a word, only grunting after we placed our orders. When I asked if I could get a po-boy to go, he said "No," and walked away. And the prices! Fourteen dollars for a po-boy was the low end, scaling up to almost $20 for the priciest lunch items. Christo and I waited quietly (afraid of doing anything to earn OB's ire) while the chef went to town in the kitchen. Everything was prepped via hot plate, griddle, and toaster oven. Lemons were squeezed. Pinches of spice were thrown. Liberal amounts of cream were poured. I smelled bacon frying up. After half an hour of preparation, we were served a terrific meal. My shrimp and grits had an ample base of creamy cheddar-laced grits, sticky but not lumpy, and mounds of plump shrimp and bacon in a lemony Bayou gravy. Christo's gargantuan jambalaya was red-hot and garlicky, with tender white chicken, Andouille sausage coins, and a savory blend of Cajun spices. We were insanely full, but couldn't stop eating. After we finished, OB said he was going to charge me for eating off my friend's plate. I protested, then detected a slight twinkle in the eye (not so gruff!). As he was ringing me up — no plate-sharing surcharge — OB explained he didn't sell po-boys to go because they'd be awful when you get them home. I also learned that OB's Cafe has been there for ten years. Ten years. Despite totally unpredictable hours, high prices, no ambience, and customer service that ranges from reticent to outright hostile, OB's Cafe has kept plugging along for a decade in Old Oakland. At essence, its only asset is really great food. Looks like that's enough. Bakesale Betty's production manager Shawn Walker-Smith is an accomplished professional baker, but his day job is more administrative than hands-on. When he told then-pregnant owner Alison Barakat that he missed getting his hands in the flour, she fiercely insisted he start up a side business. "I was not about to argue with a pregnant woman," laughed Walker-Smith. His new venture, TART! Bakery, is now fully operational, pumping out eight or nine dozen scones a week for sale at Arbor Cafe in Temescal. He makes his baked goods after-hours in the Bakesale Betty ovens, just barely keeping up with demand. Last week I requested a couple of cranberry orange raisin scones to be set aside for pickup at Arbor Cafe. When I dropped by, the baristas asked for ID: "We wanted to keep these for ourselves!" Arbor had run out for the day, and with good reason; the buttery, moist scones were a perfect balance of tart and sweet. Despite high demand, Walker-Smith has no plans to expand production, saying he needs to balance TART! with his work at Bakesale Betty. You can purchase his scones at Arbor Cafe, at Bakesale Betty during Art Murmur, or you can get larger batches by special order.